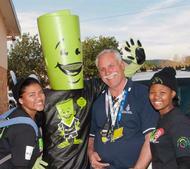 This year, Kirkwood celebrated their 15th Wildsfees with SPAR on board as the naming sponsor. The festival boasted a variety of activities and adventures for the whole family, as well as ample live entertainment, appetizing food stalls and plenty of crafts and displays. Apart from offering this unique festival experience, the SPAR Kirkwood Wildsfees also plays a key role in community development. The Waste Trade Company, in partnership with Mpact Recycling (Pty) Ltd, has had a strong green presence at the festival for the last three years. 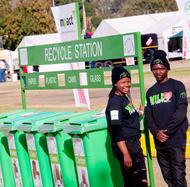 Brightly branded recycling stations were placed in high traffic areas all around the festival grounds. Organic waste bins, as well as grey water and used oil bins were also provided and stall holders had all been briefed about responsible waste management prior to setting up. St Colmcille High School learners were employed as "Green Ambassadors" for the duration of the festival. Their responsibilities included educating the public about waste separation, promotional activities with Ronnie Recycler, supervision of all the recycling stations and assisting with further sorting in the waste area. "The SPAR Kirkwood Wildsfees enables us to expose these learners to the real working world, where they experience the daily challenges of planning, budgeting, and working together as a team. All the learners are trained by The Waste Trade Company beforehand, and it gives us great pleasure to transfer our skills to them." says Emmy Nxayeka, Schools Project Coordinator from The Waste Trade Company. Festivals offer many benefits such as skills transfer, attracting tourists, fostering community pride and boosting the local economy. "Building relationships are crucial to the success of any business," says Kay Hardy, General Manager and business partner of The Waste Trade Company, "and the SPAR Kirkwood Wildsfees has provided us the platform to do just that." 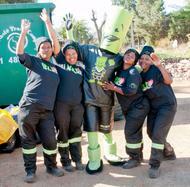 As a result of the connections made and relationships built via the SPAR Kirkwood Wildsfees, The Waste Trade Company has opened a recycling depot in Addo which services Kirkwood, Addo and many of the pack houses in the region. All the staff employed come from the Sundays River Valley community. The general public can also drop their recycling at schools and other drop off points. "We were very pleased to have SPAR on board as a naming sponsor, as they are one of our Kirkwood clients," Kay Hardy added.